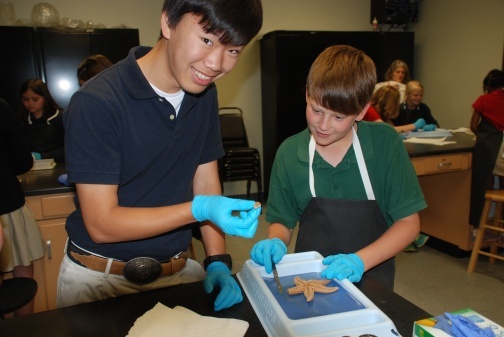 Freshman Seunghoon Lee and 5th grader Cody Monlezun worked together to dissect a starfish, in a joint lab. 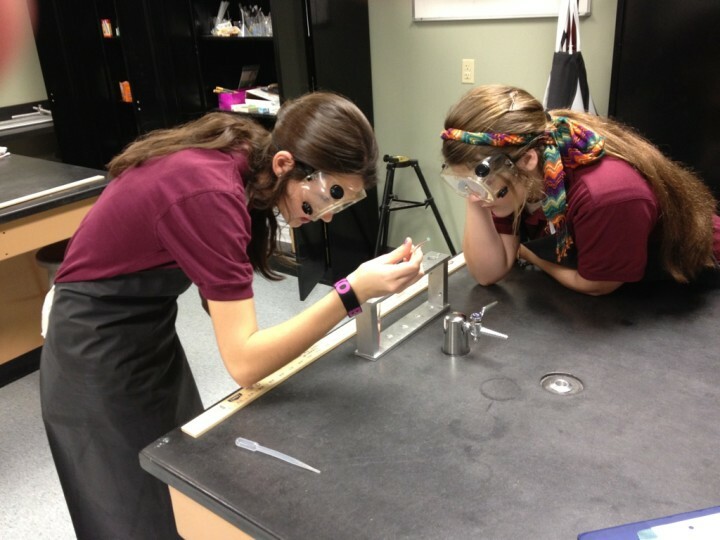 I love it when our students go into the science lab and learn hands-on. 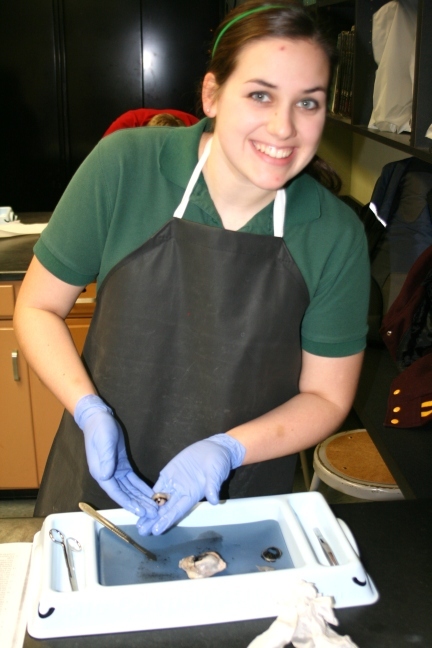 The juniors and seniors in the physics class are studying optics, so they dissected cows’ eyeballs to better understand refraction, lenses, and the anatomy of the eye. To some it was gross, to some it was engrossing, but to all it was fascinating. They followed up their lab with a visit to the Lehmann Eye Center, where our own Dr. Tim Young showed them the laser technology used to perform LASIK surgery. 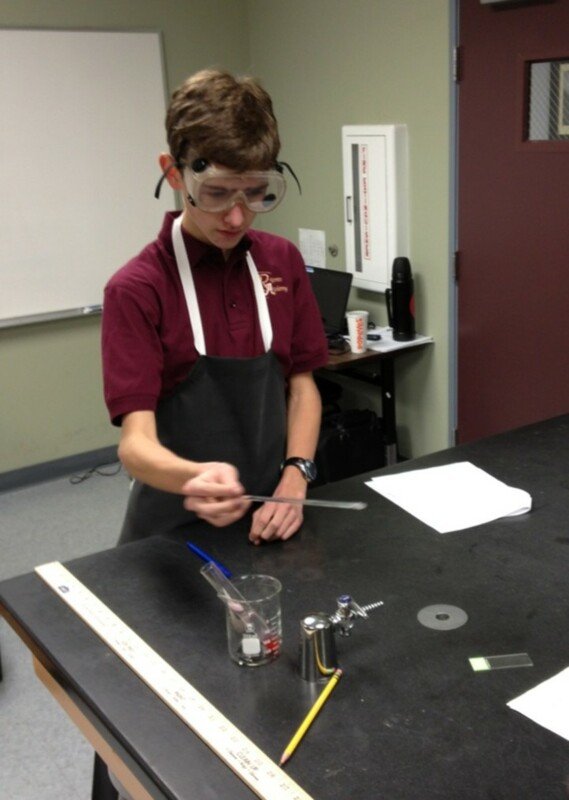 Students in Regents Academy’s junior high and high school science classes learn through hands-on experiments in the science lab. 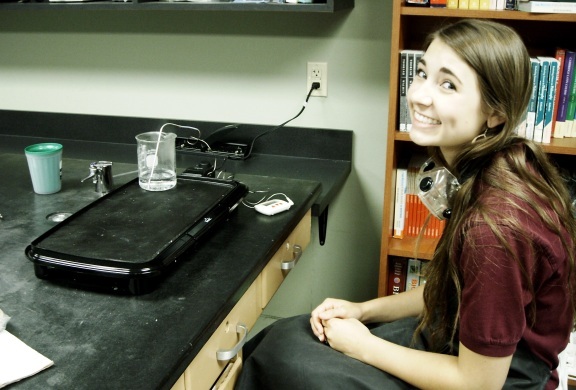 Regents is very blessed to have such well-equipped lab facilities. 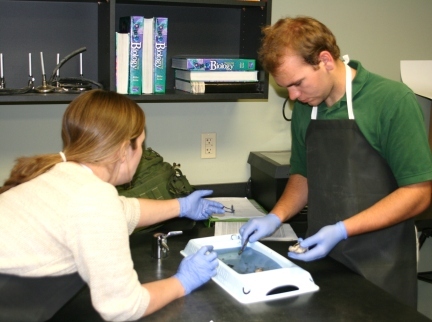 We are also thankful for Dr. Mark Sowell’s many contributions to our science lab program. 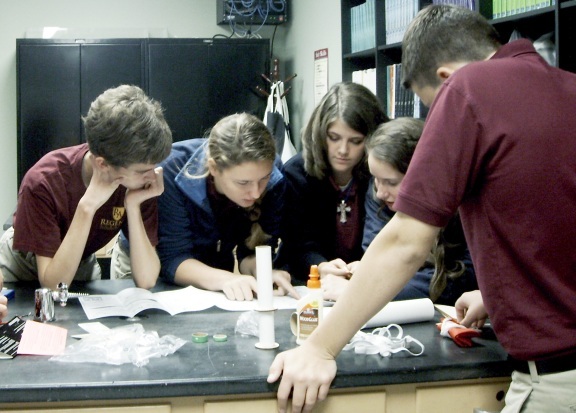 Students below are building a rocket that they launched a few days later as part of their Accelerated Studies in Physics and Chemistry class. 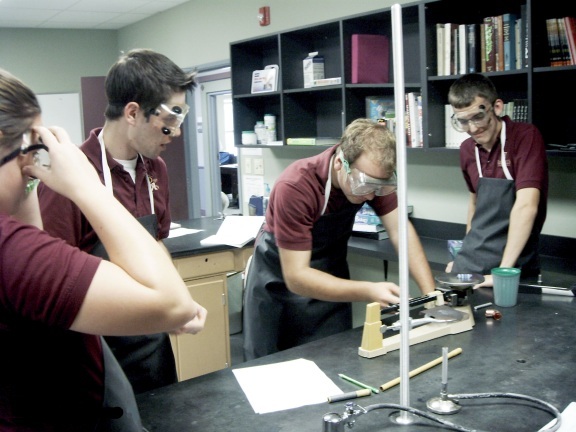 Other students below in the physics class weighed materials and boiled water as a part of their experiment. School really bugged some Regents students yesterday. Regents Academy kindergartners, first graders, and second graders participated in the 10th annual Bugs, Bees, Butterflies, and Blossoms on April 22, 2010, with lots of hand-on learning about God’s world. The event is sponsored by Stephen F. Austin State University. Read all about it in the Daily Sentinel here. Pictured are Regents second-graders Gavin Griner and Philip Franke. Now that the end of the school year is approaching and I see that there is no way for us to cover the remaining six chapters of our biology textbook as it took us three-fourths of the year to cover the first nine, I am struggling with deciding which topics should take priority. 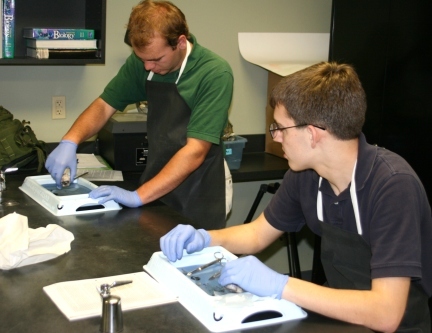 Do I teach them about ecosystems, the water cycle and the greenhouse effect, or do we talk about fish and dissect frogs? Do I skip the plants and talk about reptiles, or do I talk about birds and skip the mammals? How do I decide which is more important? This a recurring problem. Rarely am I able to cover all the material in the textbook. There is so much information to cover and so little time to cover it. But is completing the textbook so important? My type-A personality is screaming, “Yes! It is in the textbook and therefore it must be taught. Besides, if it wasn’t important to memorize the lifecycle of a mushroom, the author wouldn’t have put it in there, would he?” But the truth is, completing the textbook, atleast in science, is not that important. Everything you want to know about a subject ( and some things you don’t) are readily available on the internet or at the nearest college library. Maybe it’s time to change the way I view the role of science in school. The purpose of studying science is not to pump as much information into a student’s mind as possible and then hope that he retains it when it’s time for the next achievement test. The purpose of the study of science is to increase our understanding of and appreciation for the nature of God and His creation. A student’s appreciation for the beauty and order found in God’s creation doesn’t come from memorizing volumes of information. This type of understanding is superficial at best. An appreciation for God’s creation is better cultivated by taking fewer topics, and teaching the students how to delve more deeply into them. 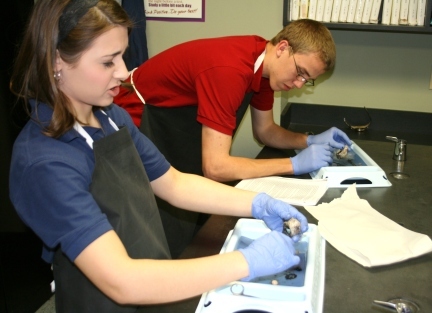 Then learning science is no longer just a transmission of information from teacher to student. 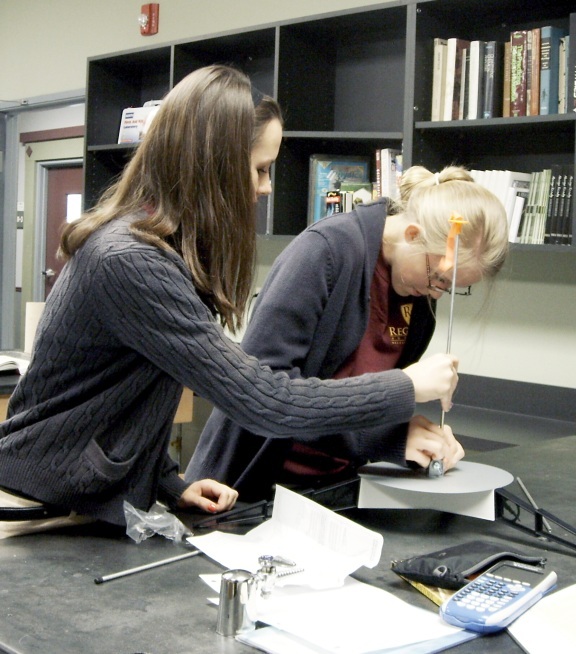 It becomes an opportunity for discovery, observation, experimentation, articulation–all the skills we desire our science students to acquire.